The Grand Central market just got a new seasonal look, but it doesn’t include the wreaths and Christmas lights. Eight columns in the market are covered from floor to ceiling in bright blue dots and hot pink stripes made from yarn. Collected by Yarn Bombing Los Angeles, the fiber art pieces came from knitters and crocheters in the United States, England, Germany, and several other countries. Walk closer to the columns and you’ll notice that each one features two designs that showcase downtown icons like City Hall and Chinatown. The yarn installations are meant to connect visitors to the historical side of the city. As a historical shopping site, the Grand Central Market, which has brought in a wave of new vendors this past year, is an embodiment of two ideas that originated in Greece: western democracy and the shopping square. “We want to use the project as an inspiration to make the functions of the market visible,” Zou says. The yarn on each column was made in collaboration by 80 knitters. Participants from overseas mailed their 12-inch-by-18-inch pieces to Yarn Bombing Los Angeles. The group worked with community members from the Downtown Women’s Center Knitting Program, the L.A. Public Library, and visually impaired students at the Braille Institute; the group also held free workshops around the city where people were invited to contribute to the project. Zou said that the wrapping for each column required knitters at all levels to spend at least 100 hours working with yarn. 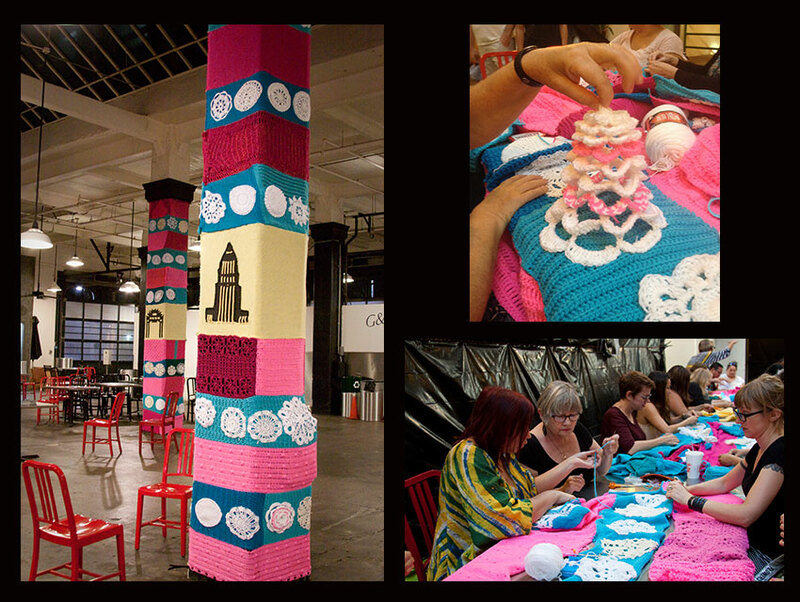 The cozy columns, which debuted yesterday, will remain colorful and covered in yarn through January 2015.